Visit I Am Just Junco online! Tier was left with one specific order and he’s not about to screw it up. He might lose all his allies, his brothers, his shot at defeating the High Order, and his own Eternal Salvation - but he’s willing to risk it all to keep one small girl alive. Tier reveals his part in the epic tale of The Seven Siblings, spilling secrets and motivations that will leave you breathless and wanting more. Destruction, clones, action, prophecy and science-fiction...the I Am Just Junco series has those elements and plenty more. With this novella written in the point of view of serious and commanding Tier, J.A. Huss reminds us that romance is an element of the I Am Just Junco series not to be sidelined. The Magpie Bridge is perfect after the uncertain conclusion of Range. The future of the world, Junco's life and everyone surrounding her is just up in the air. This novella opens readers to Tier's thoughts. He provides insight into what's happening and he also gives us what was missing from Range: certain hope, clearer answers and better understanding of Junco's motivations. I'm really glad for this novella because it makes it easier to focus on the romantic aspect that has been tagging along in the plot. It's been there, but something about taking a break from the immediate action and life-threatening decisions makes it easier to savor. Tier has such a soft and poetic side that we don't get to see without being filtered from Junco's point of view. He is powerful and fierce but his care for Junco and what she believes in makes him a heartthrob. 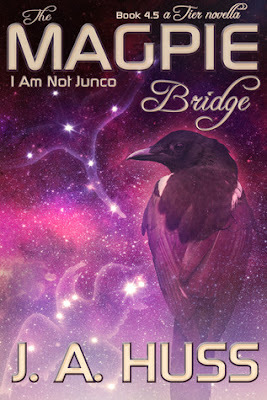 What Tier reveals in The Magpie Bridge will make you rethink this series as a whole. His words will hopefully prepare you for whatever comes next, but they'll definitely move you to think differently about him and the story's progress. Huss hasn't let us down in the entertainment and satisfaction departments and she isn't starting now! I wouldn't skip this quick novella. Not only will it open your eyes to a new side of the story, but it will also tide you over till the next Junco adventure! Hero of My Heart #BlogHop! March Kindle Fire HD Giveaway! Cover Reveals: The Night Creatures Series!